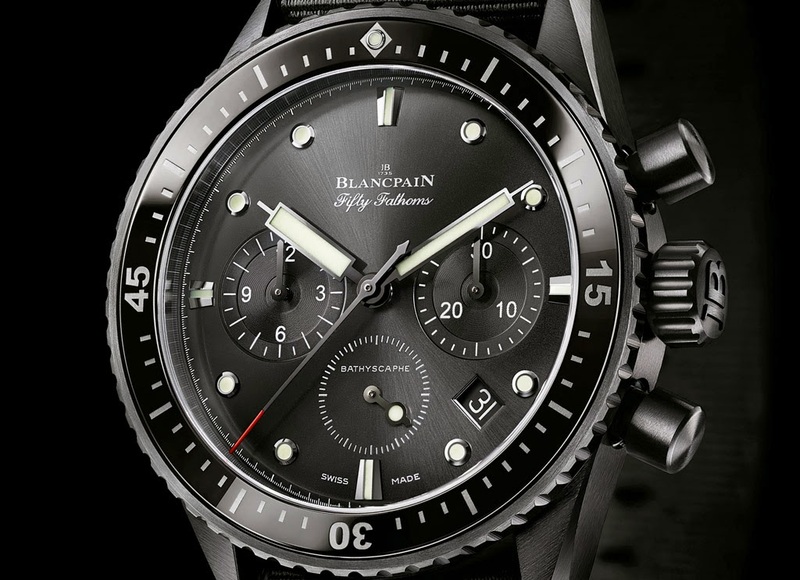 Following the Fifty Fathoms Bathyscaphe diver watch reintroduced in 2013, this year Blancpain presents a flyback chronograph version based on a new self-winding F385 manufacture movement beating at a rate of 36,000 vibrations/hour. Unveiled at BaselWorld 2014, the Fifty Fathoms Bathyscaphe Chronographe Flyback (ref. 5200-0130) is equipped with a column-wheel chronograph mechanism and a vertical clutch with a flyback function which enables the wearer to reset and instantly restart the chronograph by simply pressing the pusher at 4 o’clock. The water-resistant chronograph pushers also enable user underwater to depths of 300 metres without any risk of damaging the watch. Thanks to the adoption of a balance-spring made in silicon – a material with anti-magnetic properties that enable the watch to dispense with the inner Faraday cage – it was possible to display the movement with its 18-carat gold oscillating weight clad in NAC (a platinum alloy) through the sapphire crystal case back. The domed black dial with sunburst finish makes the lines and dots serving as hour-markers and the rectangular hands – all treated with Super-LumiNova – stand out for perfect legibility. The date appears in a small window at 4 o’clock. The unidirectional rotating bezel is made of black ceramic with LiquidMetal hour-markers so offering the highest resistance to scratches. 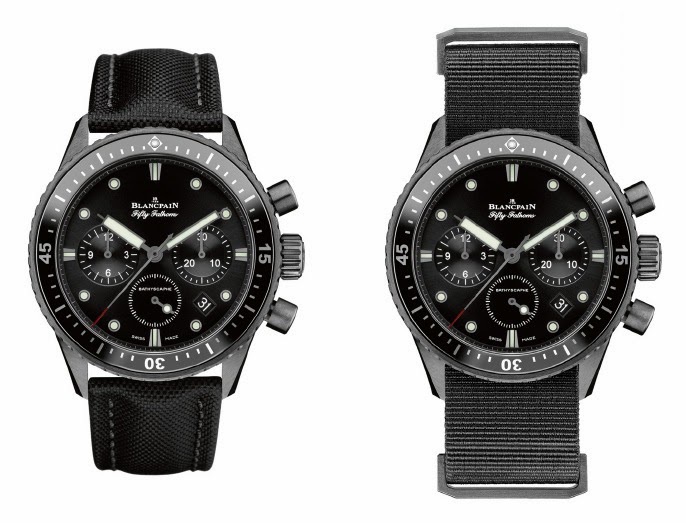 The 43.60 mm-diameter case of the Blancpain Bathyscaphe Chronographe Flyback is available in a brushed black ceramic version with a black dial, or in brushed steel with a meteor grey dial. The watch can be matched to a NATO fabric or sail canvas strap. For the steel version a metal bracelet is also available. 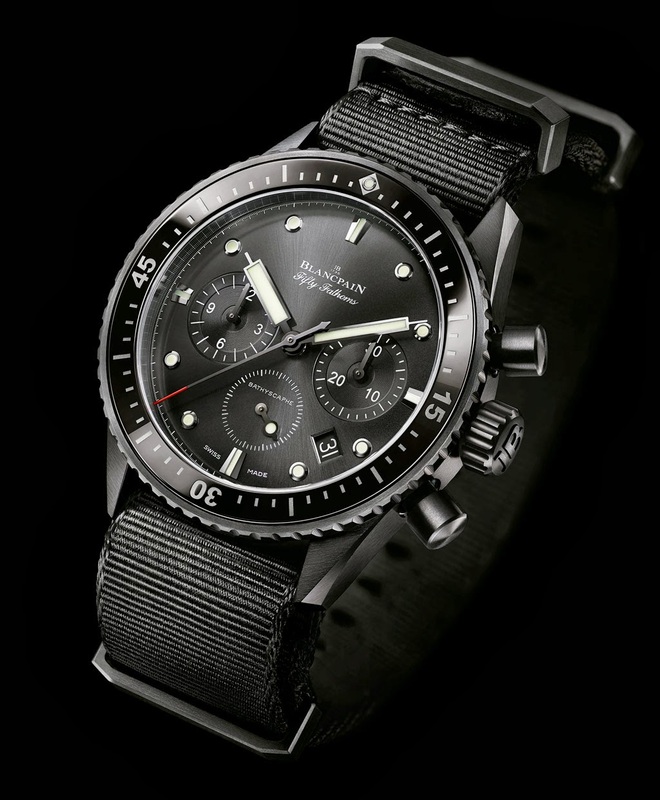 Unveiled at BaselWorld 2014, the Fifty Fathoms Bathyscaphe Chronographe Flyback (ref. 5200-0130) is equipped with a column-wheel chronograph mechanism and a vertical clutch with a flyback function which enables the wearer to reset and instantly restart the chronograph by simply pressing the pusher at 4 o’clock. 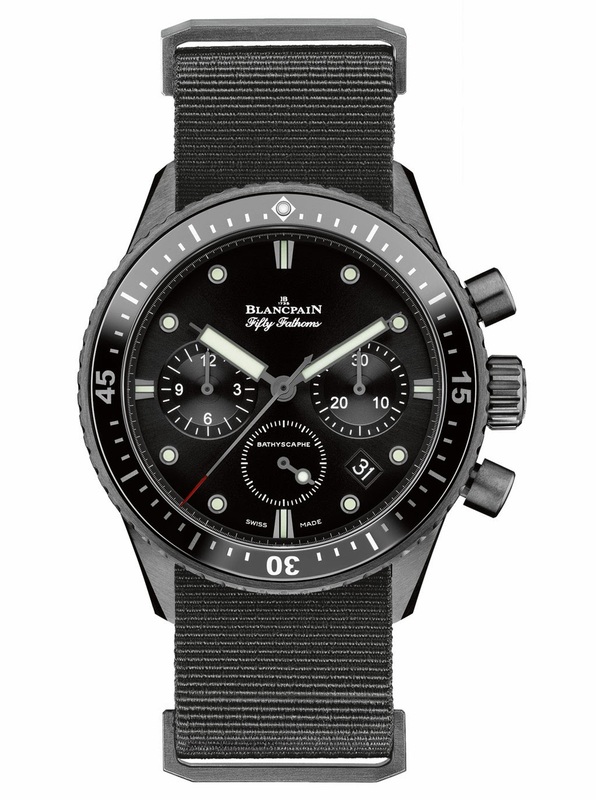 The 43.60 mm-diameter case of the Blancpain Bathyscaphe Chronographe Flyback is available in a brushed black ceramic version with a black dial, or in brushed steel with a meteor grey dial.